Recently we are getting more books to review which fall in inspirational and philosophical read category. As far as we find some substance the book, we don’t let go an opportunity to talk about it and share our views for the same. Here are some of the books we’ve shared our views recently, which are not fantasy fictions written for thrills and entertainment purpose. Adding to the list, the latest one is The Hungry Swan : Ballad Of The Soul by debutante author Tavamanickam Ramasamy (aka Tava Ramasamy). Though, the book is provided to us for free in order to share our reviews for the same, the reviews and views mentioned here are unbiased, as always. 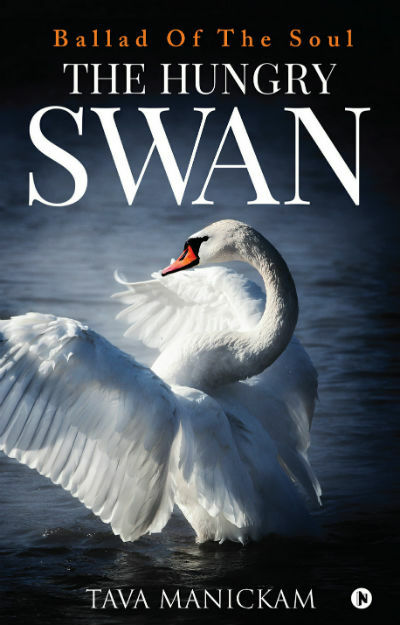 The Hungry Swan, is a story of inner awakening. The pious soul is symbolized as swan, and its quest is represented as its hunger. So as the title (and tagline) fits in with the central thought of the story, the cover page reflects the same nicely. However, you find the cover page very simple, and not much attractive, from a regular reader’s perspective. It is decent one for sure. The story starts in the pre-independence era which the people working for the government (British) considered themselves lucky, and looking at their rulers with high regards. It was the time when a large number of people considered English and English speaking fellows, a step ahead of the rest of the society. It was the time when the landlords were considered nothing less than count. For the village/town/city he resides, he is almost the king of the same. Where people used to share his happiness and sadness actively. In one such rich family, a boy was born. He was given a very fantastic name, Mrityunjay. He was fondly referred as Jay, and it remains his identity for the major part of the book. He was living in a very comfortable environment, and enjoying the privileges which are not available to many. He has his own way of living a life. One fine day, he decided to run away from the home and explore the life on his own. The rest of the book explores the journey of Jay where we meet Aditi, Imran, Guruji and many other characters. The book starts in interesting way. The way the school of small town during those days is explored in quite authentic way. At the same time, the incident of getting a lady from a wealthy house in labour pain, and the way entire village is called in into the compound of the ancestral home of the family, the way they are taken care of, is written brilliantly. In fact, the early childhood days of Mrityunjay and other aspects will remind you of Malgudi Days TV Serial. So they both ended up doing nothing, and as their families were well off, the question never arose as to what they should do next. His friends were a handpicked lot; they were not beside him because of him but were around in spite of him. Here are some interesting lines from the book which has its own dose of philosophy, inspiration, satire, reality, spirituality and wisdom. We are so much the slave of the body and we think we are the body. The body being awake should never be constructed as the self being awake. Love is like that; it is there, but it will never bind! Whatever you thought of as “you” has kept on changing all the time! You thought you were a constant! You will never be that! Life will always be an unfinished business. Jay, you cannot explain to anybody about your faults! Because even before you admit to your one score faults, the world has lined up a booklet of charges against you. The dessert heat was already stepping up as summer was at its peak. In an hour, it would start beating down mercilessly. So, if you love reading books which requires you to get involved in it and pay your un-diverted attention towards the same, then you may enjoy reading the book. To me, the book loses its path after a nice take off. Though, it still works in bits and pieces, but somehow the entire journey of the protagonist fails linking the reader to the same. There comes some interesting characters in the book, some good descriptions, some incidents etc. but, I don’t find the things adding up smoothly, at least as much as I’ve expected from it. The characters of the book are gradually defined, however, it still leaves some points unexplained. Our present is alway sbecoming the past and the future and was never for a moment the present. It slipped straight from the future into the pastl nothing ever happened in the future, yet we are most concerned about that future. I have already taken some money from my mother… I will eke my livelihood begging. The book could have been much better. Let me conclude by a simple yet effective message you can get from the book. Your life will be the greatest epic, the greatest drama that was ever told, and you will be the hero of all things to come. The world is the stage that has been put up for your exclusive entertainment. A book which starts in really interesting way, but then it goes into something unexpected and then turns out to be a philosophical tale, which fails making a strong impact. If you like serious reading, you may like it.